The July issue of magazines is proving to be a bumper month for beauty freebies.. thank goodness we have moved on from cut your own size paper thin flip flops! 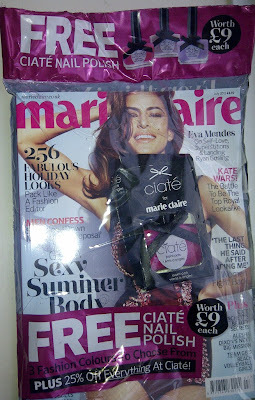 Marie Claire are giving away a full size Ciate Nail Polish worth £9. There is a choice of 3 shades - Bon Bon (a soft pink - just like the sweet), Jelly Bean (a bright pink, I went for this) and Purple Sherbet. I went for purple sherbet-it's not a colour I really wear but I love it! I really like Ciate polishes-I got a really nice neutral shade as a freebie last year (not disimilar to the pale shade with MC mag) and I wear it loads!! Fab Liz Earle Cleanse and Polish Offer!